Checking your tire pressure and adding air seems like the simplest car maintenance task ever, right up there with changing the wiper blades. So why does it always stress you out? Why do you have to google how to put air in tires? How to check tire pressure and how to put air in your tires. Step 1. Don’t ignore the tire pressure sensor. When that little red light comes on, it seems more like an annoyance than an emergency. It’s not the oil light, which is bad, or the check-engine light, which is very bad, or all the dash lights, which is the absolute worst. But tire pressure does matter, because underinflated tires are bad for fuel efficiency and handling, and they have a bigger risk of a blowout. So when the tire pressure sensor detects a problem, stop and check it out — even if the tires look fine. The one exception is on frigid mornings, when your tire pressure sensor light may come on because the cold air in your tires has contracted. Just drive a few miles and see if the sensor goes off once the day has warmed up a little. If it hasn’t, you may need to add a little air. Step 2. Find your recommended tire pressure. 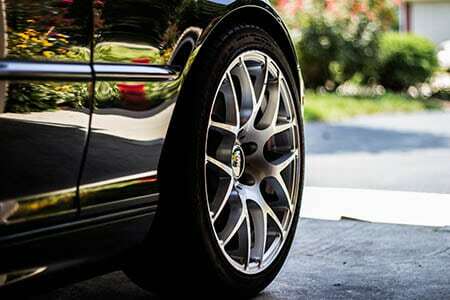 Recommended tire pressure is the correct amount of air to put in the tires on your vehicle. It’s not the same thing as the maximum tire pressure that’s printed on the tire itself; that number means the pressure required for the tires to carry your vehicle’s maximum load. You shouldn’t have any trouble finding the recommended tire pressure. It’s usually printed on a label in the door frame, glovebox door, or fuel door, and it’ll be listed in the owner’s manual, too. Read carefully, because rear tires may need a different pressure than the front tires. Step 3. Check the tire pressure. Fish around in your glovebox for that tire pressure gauge your dad gave you when you were 16. (Can’t find it? It’s time to organize your glove compartment.) If all you have is a cheap, pencil-style gauge, it’s time to upgrade to a digital or dial gauge, which are much easier to use. When Consumer Reports tested several tire pressure gauges, the best they found were two digital Accutire gauges, both costing under $11. Now, here’s how to check tire pressure. Ideally, wait at least three hours after the car’s been driven. Unscrew the valve stem cap and press the end of the tire gauge onto the stem. If you hear hissing, press harder until it stops. Now, check the tire pressure number in PSI, pounds per square inch. With pencil gauges, the plastic insert will shoot out; the place where it stops indicates the tire pressure. Step 4. Add air to your tires. Put money in the machine, and slowly add air to each tire by attaching the hose to the valve. Be careful not to overfill them, and use your own gauge, not the beat-up one attached to the hose, to check the PSI. If you accidentally add too much air, you can use the little nubbin on your tire gauge to let it out. When you’re done, don’t forget to replace the valve caps. If your tire pressure sensor comes on again, you may have a nail or other sharp object embedded in the tire, causing a slow leak, and it’ll need to be patched. Congratulations! Now you know how to check tire pressure and how to put air in tires, and you’re ready to roll. And you might be now ready for more DIY car repairs, like changing your headlight bulb or checking and changing your oil. Here’s another way to feel like a champ: Save a bunch of money by comparing free, personalized car insurance quotes on Compare.com.